When you use contents of baby food jar clean completely and dry. Paint the lids with two layers of chalkboard paint. 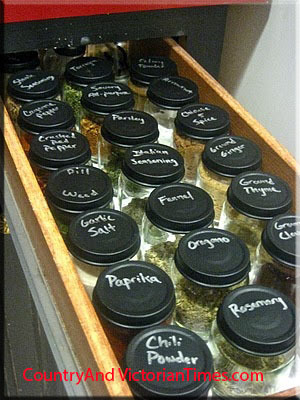 Now you can use a top drawer and have your spices more easily available to you. Don’t stop at spices – what about all of your findings, sewing notions etc.? Would be great for your excess office supplies too like paper clips, rubber bands, staples. This entry was posted in Crafts ~ DIY ~ Projects, Home, Car, Yard, and Pets, Tid-Bits & Funnies, ~Home, ~Recycle & Upcycle, ~Recycling & Upcycling, ~Sewing and tagged babyfood, board, chalk, clips, drawar, findings, Food and Related Products, jar, kitchen, lids, notions, paint, paper, spices, staples, storage, Supplies, toothpicks, ~Baby, ~Food, ~Home, ~Office, ~Sewing. Bookmark the permalink. Thanks for stopping by – Have checked out Segmation website and am intrigued by what I saw. Would be happy to post an article for you. If interested please email me at: jeffreyscottthomas@gmail.com. I found your blog interesting as well. Thank you for stopping by.